The first item I thought I would bring to you this week is news of the rescheduled Becket Lecture that will now take place on Tuesday 6 March at 6pm in The Michael Berry Lecture Theatre, Old Sessions House. As you may remember, the lecture will be given by Dr Marie-Pierre Gelin (UCL) and she will be speaking on ‘Thomas Becket and his Predecessors in Canterbury’. Booking not required, and we at the Centre will look forward to seeing you there. In some ways the theme this week is the distinctive nature of Kent culture, or at least that the particular nature of the county led to the production of a fascinating archive and finally that this, too, had a bearing on a certain Canterbury institution. Two nights ago I attended Dr David Grummitt’s lecture to Canterbury Historical and Archaeological Society at Canterbury Christ Church. The Society’s committee had decided to use the three autumn meetings for talks on this year’s great anniversaries, and the December meeting was the last of these on the Battle of Agincourt. As the head of the university’s School of Humanities and a late medieval/Tudor historian, Dr Grummitt is also involved in the Centre and on the committee organising the Medieval Canterbury Weekend. At the Weekend on Sunday he will be speaking on Henry VI, drawing on his very recent biography of the king, but on Wednesday he concentrated on the exploits of the father, Henry V.
This week I thought I would report on a variety of matters linked to the Centre. In terms of the chronology of the events, I’ll start with that relating to the modern era and work backwards. Consequently it gives me great pleasure to draw your attention to a new booklet by Dr Martin Watts about the St Gregory’s Great War Memorial and those commemorated. As you may remember, Martin gave a lecture on the war memorial last November in Canterbury Christ Church’s St Gregory’s Centre where the memorial is housed. Subsequently he has been engaging in further research on the men (and woman) whose names appear there. He drew on some of his findings for the ‘Great War and its Aftermath’ study day in May and now he has brought his research together in the booklet. At the moment I am not sure where they will be available, but if you are interested it would be worth contacting the History and Archaeology section of the School of Humanities. I thought I would just give you a flavour of Martin’s research by summarising a couple of topics he includes in the booklet. For those of you who know Canterbury, you will be well aware that the eastern suburbs could be characterised as the military sector, at least until relatively recently. This was because from the time of the Napoleonic wars it was home to units of infantry, cavalry and artillery, and, as well as these regular regiments, there was a depot for the militia. Such an influx of military personnel and their dependents necessitated extra parochial provision, leading to the building of first St Alban’s church in Military Road (today rededicated as All Saints’ church) and then, in 1852, St Gregory’s church. From its inception, St Gregory’s was a very small, poor parish and this is mirrored in the experiences of almost half of the 144 names on the memorial, because the fallen of St Gregory’s came from families which depended on unskilled, casual and domestic employment. Today’s concept of ‘a living wage’ was not a political issue in anything like the same way, rather the workhouse was the final resort for the poor, often for short periods when things became totally hopeless. Thus for some St Gregory’s families, not only had times been hard before 1914, but the loss of son(s), fathers, and brothers thereafter in the Great War heaped even further hardship, as well, of course, the anguish of the deaths of family members. For example, several parents lost two sons, as was the case for Albert and Mary Powell of Spring Lane, who first lost their unmarried son Frederick in 1916, and then his married brother Bertie two years later. Thus in addition to the grieving parents, Bertie’s widow Rose was left in Broadoak to try to come to terms with his death. I will leave the rest of Martin’s findings for those who are particularly interested in this aspect of Canterbury’s history to read for themselves. However, it is worth mentioning that Martin would be delighted to hear from anyone else who knows relatives who are commemorated on the memorial, or any other details regarding its creation or, indeed, anything else linked to this particular Great War memorial. Turning to my second topic, I have just heard that one of the active local history and archaeological societies in Canterbury has decided to award small grants to two projects that should enhance our knowledge of the city and cathedral. One of these grants will help to fund the cost of undertaking on-site analysis of the Ancestors’ stained glass currently in the Cathedral Chapter House using a method known as Portable X-ray Fluorescence (pXRF). 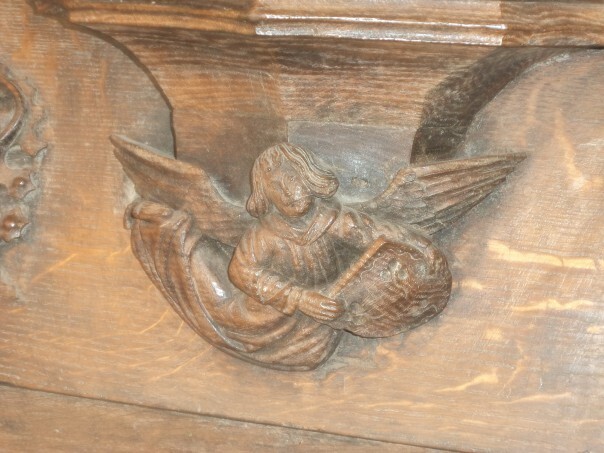 The successful doctoral applicant from York has used this technique to good effect at York Minster. She has been able to gain ideas about the organisation of medieval glass-painting at the York workshop, including identifying the work of different painters in addition to different sources of glass. Leonie Seliger from Canterbury Cathedral (see previous blog) is very excited about such work because not only may it reveal ideas about the technical aspects of the work of Canterbury glass painters in the 12th and 13th centuries, but may also provide answers for conservators regarding issues surrounding different rates of decay and other conservation problems. The second successful applicant is a Christ Church postgraduate from History who is working on the post-Reformation history of Eastbridge Hospital. Again, for those of you who know Canterbury this is an iconic building in the High Street that began its life as a refuge for poor and sick pilgrims on their way to St Thomas’ shrine. Arguably it might be said that the most fortunate pilgrims were those who died at the hospital because they would expect to be buried in the cathedral’s lay cemetery, probably having a wax candle made from the great Dover (rope) candle that sat on its reel next to the saint’s shrine, a piece having been cut off for the purpose. As a result they were ‘close’ to one of medieval Christendom’s premier saints, as well as to the high altar in Christ Church, such physical proximity highly valued especially for those who would have had no other chance to achieve this outcome. Yet after 1538 this relationship between hospital and recipients was destroyed, along with the shrine and the other aspects of medieval pilgrimage, requiring the hospital authorities to find an alternative function if it was to survive. Like its fellow archiepiscopal foundations, St John’s and St Nicholas’ hospitals, this required readjustment, and of the three Eastbridge’s position was by far the most precarious. Even though some research, including the late Canon Ingram-Hill’s published study of Canterbury’s ancient hospitals and almshouses, has been done on this period of Eastbridge’s history, there is further scope, especially in the context of changing attitudes to charitable provision and the poor in late Tudor and Stuart society. At the moment this is a ‘fashionable’ topic in social history not least because of its current resonances, and local and regional studies of this nature can provide important findings that indicate both the norm and the particularity of local circumstances. Professor Louise Wilkinson is overseeing his Masters thesis which he is intending to extend as a published article. This is not the only Canterbury topic on which Christ Church postgraduates are working, and another Masters will be on women’s lives in the High Middle Ages, a topic close to Louise’s own specialism (in addition to Magna Carta). My final piece of good news, at least from my perspective, it that Keith Parfitt of Canterbury Archaeological Trust has begun an archaeological excavation with his team in Dover. The site is near that of the Townwall Street excavation over a decade ago which provided important discoveries regarding the post-Conquest fishing community among other matters. I’m hoping for an equally fruitful investigation, and hopefully the opportunity after the excavation to go ‘digging in the archives’ again to find out more about the people who lived and worked there in the Middle Ages.